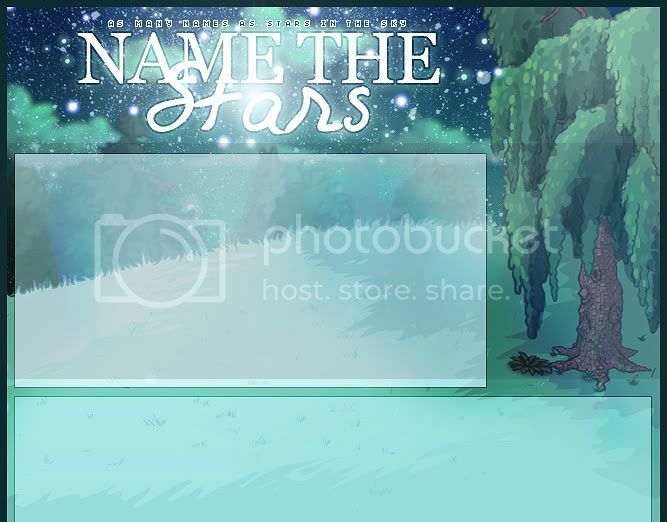 Welcome to Name the Stars, created on May 7th 2011. This is a site of untaken names dedicated to naming your star, be it your precious pet, your dream site, or even a new account. I am Alex, namer of the stars, and if you have any questions, comments or concerns, do not hesitate to share them with me. Also, if you would like a custom name to suit your needs, feel free to ask! Feel free to use a button on your new pet's lookup or petpage! Would you like a unique, original name for your star? Is there a certain color, species, gender or personality you want to create, but never thought of the perfect name? Ask Alex for a custom-made name by requesting with the appropriate form below! If you would just like to ask for advice on an existing name on the list, you can Neomail Alex informally. Though this site is dedicated to giving our stars brilliant appellations, not all pets have had the fortune of being named with such care, especially one's beloved first pet. There is a phrase immortalized by William Shakespeare: a rose by any other name smells as sweet. In this section, we recognize those roses who are as special to their owners as any 'well-named' pet. To submit your rose, simply send me a message. Feel free to use this button on your pet's lookup or petpage if they are on here! Though I do condone using my fine-tuned names for your stars, what of those elusive, rarely seen stars of beautiful names – without owners? You may want to create a unique pet of your own, but the Pound has so many beautifully named, already existing pets, lonely and starving. Every week, I will list 10 names of pets in the Pound who deserve better, with a short evaluation of the name beside. Click the picture to see the lookup, and the name to find the Pound! Candy__Smiles__ Nothing can make you smile like Candy can! Gweetox Not really a Xweetock... but a Gweetox! What implications could the 'g' change have? 'Ghost'? 'Green'? 'Guardian'...? Lavilovie French for 'Cheap o' life', this pet surely won't put a strain on your wallet. Mailee_May April showers bring May flowers," and Mailee will happily bring flowers to her new owner! Ranitas_tortuga Tortuga is an island in the Caribbean, and 'ranas' is Spanish for frogs, so 'ranitas' are smaller, cuter frogs. Salsa11 Mmm... who doesn't like salsa? Sfhaqr It appears to be a random combination of letters, but think of it as 'Safhaqar' (pronounced 'sahf-hah-kar'). x_Jhaya_x Aside from the decorative x's, Jhaya is pretty well-named. Feel free to use this button on your new pet's lookup or petpage! Have you ever seen a Neopian species and contemplated the origins of the name? If you have, you've come to the right place. Below, I have researched Neopets history and etymology – that is, the origin of the names. If you have any information, especially on the names marked with an asterisk*, or you would like to argue an origin, please Neomail me! How the names are organized? In the pet names section, first come the Real Word names. These are real words, real names or real places. They have been found in dictionaries and comply with the Word for Word real word directory standards (though it is now closed). The second section is Constellations, for multiple words combined. The following section is Semi-Real Word, or names that are almost Real Word, but not quite. This includes words in other languages, backward spellings, typos and misspellings. The final section is Miscellaneous, for names that have been altered further, or completely random. The usernames section is organized similarly, though with no miscellaneous section (based on demand; change this?). Sites are only organized alphabetically, with tags. What tags are, and how to use them? Tags are part of a quick and easy system to find names. Most names come with a tag, which is a category that the name falls under, in brackets. To use a tag, simply hold down the Control (or Command for Mac users) and F keys on your keyboard and input the tag in brackets, for example, (sandan-related) then press enter. The number that shows up (Safari and IE users) is an indicator of how many names have that tag. Press the 'Next' button to see the next name on the list with that tag. Why this site needs tags? There are three main functions of tags, and no drawbacks. First, you can use a tag to find a name that has already been predetermined as suitable for your needs. Second, if you like the style of one name and wish to find similar names, you can use a tag on the name to look at names in the same category. Lastly, when searching a tag, you can see the names in their category, without leaving the larger categories of Real Word, site names, et cetera. Why usernames don't have tags? There is not a great deal of usernames (partially due to the fact that they are not in demand, since each player can only acquire 5 accounts), and there is not as much of a need for precision. Pet names might need to be tailored to a character or paint color in mind, and site names need to fit the type of site, but usernames can be as random and 'badly-named' as you want. If you need to link back if you use a name? For pet names, I'd love it if you could show some appreciation and put a button their lookup. However, this isn't mandatory. For usernames, I honestly don't care! However, for site names, I ask for some common courtesy - a bit of recognition in your Credits section, maybe a link back, perhaps. Please Neomail me if you do use a name so I know it's taken! Site names are just cute little phrases, noun + adjective combos, or something that goes with the site type. Usernames are even simpler, just a random word or readable letters. Pet names, however, can come to me in a variety of ways. I see the word in the dictionary and try that directly as a pet name. I use a method where I take a word, flip it, then add or remove letters (occasionally flipping the name backwards again during the process) until I have a short, sweet name. I might hear a word in a foreign language (typically French, which I study) and search it, or hear a word and check with an incorrect spelling. A lot of times, a combination of syllables and letter patterns are put together and checked for availability. I love creating characters, ideas and names. After a while, though, I realized I couldn't keep all these names to myself. I was preparing to open an 'ideas' site in mid-2009, where I'd give away these characters and site ideas. It was originally going to be called Storm (so you'd 'get storm'd' when you were named) but after discovering Storm CSS (now closed) I thought it would be confusing. It was then going to be called Think Big, but before I'd a chance to open the site, I realized not creating your own characters is no fun. Now, all I offer is names, but this site has a wide variety of extras as well! My name is Alex (though please Neomail me here!) and I love making characters and names. I think etymology is awesome and Shakespeare was the coolest guy of his century. I might open a pixel site sometime because I like pixelling - as many pixels possible, on this site, are created by me! However, you might already know my Altador Cup site, ROOT, or my super-new review site Euphonious. The pet who hosts this page, Czoar, is a special one. Her name is a homophone to soar, which means 'to fly'. I had loved this spiritual name, and so I created her for the December dream pet giveaway, to be a Shadow Draik. Now, she remains one of my most precious pets. I hope this page offers names that you cherish as much as I cherish Czoar's! Don't worry, just ask away and I'll try to answer you as soon as possible! Find your way by the stars? Appellation is a fabulous untaken names site by Michelle. Like Name the Stars, Appellation offers a huge variety of pet and usernames. There are tons of categories to choose from so you can find exactly the kind of name you're looking for - I personally love to browse sections like Mythology and Different Language. Don't forget to play The Name Game on your way out! Requests for affiliates are open, with preference for untaken name lists! *Note: Each site is classified by only one tag - the first tag. Miscellaneous sites are classified as such unless there is another tag; in the event of multiple tags, the first tag other than 'miscellaneous' will be counted. Some origins guide information by Jellyneo.net.